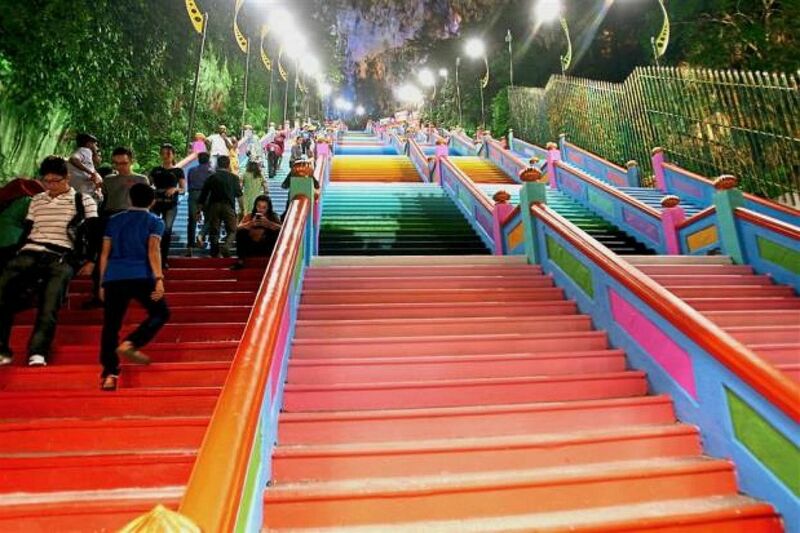 BATU CAVES (THE STAR/ASIA NEWS NETWORK) - The colourful staircase of the iconic Batu Caves Temple that has gone viral on social media could land the temple committee in trouble, as the multi-million ringgit painting and renovation works were not sanctioned by the National Heritage Department (JWN). The Sri Subramaniar Swamy Temple located on the top of the staircase is a National Heritage site listed under the National Heritage Registry. Any application for development must go through the heritage department. In a 2015 interview with StarMetro, Batu Caves Sri Mahamariamman Temple Devasthanam committee chairman R. Nadarajah said that three lots encompassing 6.6ha in Batu Caves - Lot 1197, Lot 4557 and Lot 6020 - had been designated a heritage site in 2012. He added that a few other sites were gazetted as well, including the entire compound where the yearly Thaipusam festival takes place. Activist and Sentosa assemblyman G. Gunaraj told StarMetro that JWN conservators were unhappy, as permission had not been obtained from them as required under Section 40 of the National Heritage Act 2005, prior to the renovation. "I was told that in accordance with the Act's Section 40 requirements, the temple management must refer to the department to identify best conservation methods when there is any development or renovation work done in close proximity to a national heritage site. "This is to ensure the integrity and legacy of the heritage structure is maintained,'' Mr Gunaraj said. His contacts in JWN had informed him that the paint works and renovation were not in harmony with the surroundings, he said, and was a "disaster" for a heritage site. "They are disappointed that efforts to get the temple listed as a heritage site might have been in vain, as the paint job could lead to the temple being delisted,'' he said. Mr Gunaraj said he had read that when a heritage site fails to correspond to its "outstanding heritage" value, it could be removed from the National Heritage list. International Council on Monuments and Sites (Icomos) Malaysia committee member Rosli Mohd Ali said: "It (renovations at Batu Caves) has been going for a long time now, but whatever they do, they must get consent from JWN. "The temple committee cannot expect the temple to be on the heritage list and yet do whatever they like,'' he added. Mr Rosli, who is also an architect, cited the historic monuments of ancient Nara, which is a Unesco heritage site in Japan, as an example. "It included a group of Buddhist temples which had great cultural and heritage significance. "When the government restored some of the sites which were deteriorating, it was done following stringent guidelines to ensure the integrity of the site was intact with an adequate buffer zone," he explained. When contacted, Tan Sri Nadarajah said they had the necessary approvals to proceed with the renovations. "The paint job does not require any approval. For the renovation, we had approval from Selayang Municipal Council (MPS). "Since we are not constructing any new building, we did not need to seek approval from JWN,'' he said. However, MPS corporate affairs deputy director Ahmad Fauzi Ishak said there was no record of any approval given for any works in Batu Caves in a long time. "In fact, we are still waiting for the documents and corresponding technical reports required to legalise the structures and buildings in and around Batu Caves, which has been going on for the last five years," he said. Mr Nadarajah said the renovation works on the Batu Caves ground began early last year. "In preparation for the consecration ceremony on Aug 31, all 13 temples in Batu Caves underwent renovations, and this included new entrance towers, new tiles, paint and sculptures, among others. "Experienced temple builders from India were commissioned for much of the renovation works. The temple now looks a lot like those in India, or even better. "We have spent RM6.1 million (S$2 million) so far, but the actual cost will be revealed on the consecration day," he said, adding that the sum was from donations. Mr Nadarajah said the idea for the steps' colour scheme was mooted by his son Datuk N. Sivakumar, who also sits in the committee. He added that the colourful steps would attract more tourists to visit the site and the renovations would give devotees a more comfortable place to pray. Mr Nadarajah's claims, however, have raised concerns, as MPS is still in the process of legalising many of the structures in Batu Caves which were built without going through standard approval processes. It was also learnt that JWN's enforcement team have been visiting the site regularly since Sri Subramaniar Swamy Temple was listed as a heritage site, for monitoring purposes under Section 39 of the Act, and the temple management were repeatedly reminded to get JWN's consent for any works carried out at the site. The temple, also known as the cave temple, is one of 30 caves open to the public. The cave temple has a 100m vaulted ceiling, and right above the cave is an opening where one can see the sky. The stairway is divided into sets of 17 steps by landings, and a 272-flight of steps lead up to the temple. Previously, StarMetro reported that Batu Caves could not qualify for the Unesco World Heritage List, as its current building was not in harmony with its surroundings. Meanwhile, the JWN source said they were looking into the matter to get an explanation from the temple management to see what kind of action would be taken.